I picked it up for $27 worth of trade (it’s worth about $33 in “VF” grade), and I haven’t been able to stop playing with it since. I’m on a mission to find a coin that’s smaller from my collection but so far I’ve failed miserably. 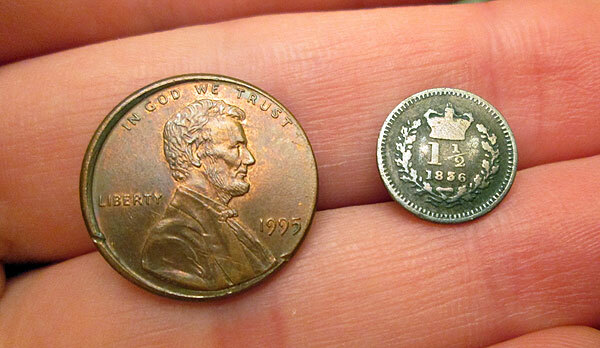 Anyways, as you can tell this coin is teeny tiny. And what an interesting denomination too! 1 and 1/2??? It would be interesting to see how much that would be worth in today’s dollars if it were around… Maybe it was like a 50 cent piece? The thing’s almost 200 years old! Pretty incredible you can still see most of the markings pretty well too. Anyone else add any interesting coins to their collection lately? That thing is silly! How many of those were lost in pockets over the year? haha… found it in pocket change! Check out the wire coinage that came from czarist Russia. They would literally take a piece of wire, hammer it with the stamp for the denomination, clip it off and then do the next coin. These things are itty bitty, like you can fit four on a modern cent! The last time they were made was by Peter the Great in 1725. 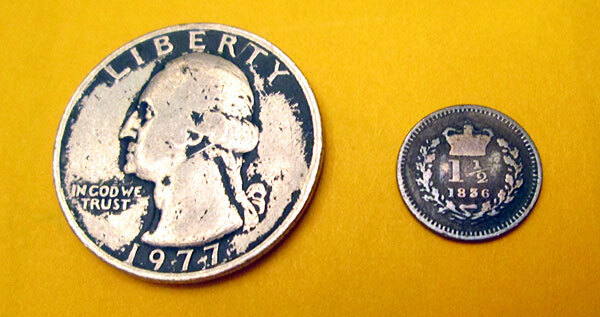 Incredibly small coins that are still used in circulation are the Sentimos of the Philippine Piso. 1 Sentimo is only worth about .00023 USD, and so the coins have to be extremely small to avoid people melting them. 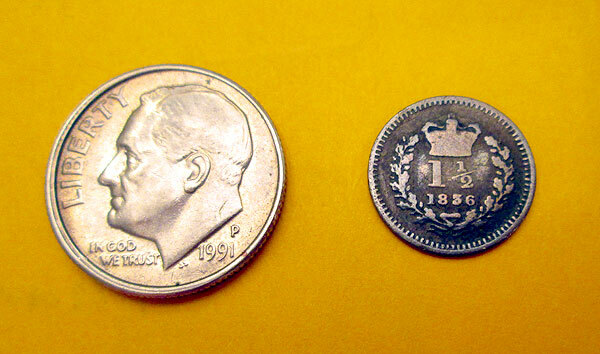 The Philippines have had many different versions of them, but some sentimo coins are 1 centimeter in diameter. Oh wow… that’s pretty interesting! Try an 1893 Maundy Silver 1 Pence Coin. 11mm and a whopping .5 grams. The detail on these is amazing! The 2 Pence is 13mm and .9 grams. You seem like a man in the know & I just want to know if there are any odd/renegades you may recommend to make jewelry from. I know it sounds a bit sacrilegious because I’ve been a collector in the past, but a client wants a bracelet with different small coins that are or once were the real deal. Any ideas? Please give me a shout out if you have any ideas. That coin would probably have been called a penny-ha’penny, where “ha’penny” is pronounced like hape-ny. A penny and a half was one eighth (1/8) of a shilling. There was probably a threepenny (“threp-ny”) bit (worth “threppence”) twice its weight and a sixpenny bit (worth sixpence) twice the weight of that, a shilling bit twice the weight of that, and a two-shilling bit (a florin) twice the weight of that, all five coins being made of the same alloy and having the same proportions. That being the case, the shilling piece would have been twice the diameter and thickness of the penny-ha’penny, and the florin would have been twice the diameter and thickness of the threepenny bit. i can’t find any information on a miniature coins in a packet. in the packet are a nickle,one cent,quarter and half stamped with Kennedy face. they are pretty clear on these tiny coins. Sounds like a novelty item made by a 3rd party somewhere – it’s not from the U.S. Mint. I have a coin about half that size very old and primitive I have never found another! I’ve seen one simular in India but this is older more primitive! But that is definitely not the world’s smallest coin! In case you’re still interested, some quick fiddling around with an inflation calculator tells me that a penny-ha’penny would’ve been worth approximately £6.55 in today’s money in 1836, which is roughly $8.37 at the current (14th June 2017) conversion rate. hah – awesome!! love it.